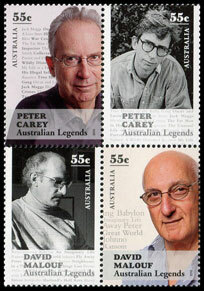 Peter Carey (1943-) is one of only two writers to have won the Booker Prize twice (for Oscar and Lucinda and True History of the Kelly Gang). David Malouf (1934-) has been awarded numerous international awards, and has been shortlisted for the Booker Prize. Apart from being a novelist he has written a number of short stories, poems and plays. 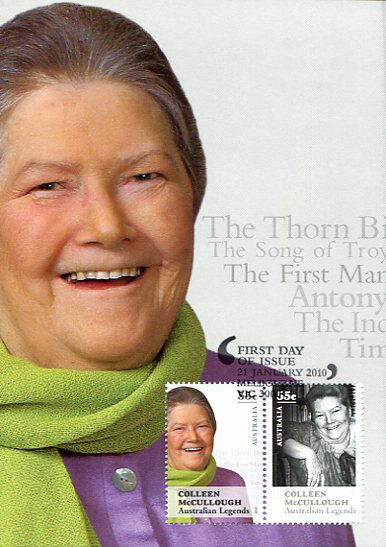 Colleen McCullough (1937-) is well known for the depth of historical research she does for her novels. She currently lives on Norfolk Island and appeared on a Norfolk Island stamp in 2003. South African born Bryce Courtenay (1933-) is one of Australia's most commercially successful authors, whose books include The Power of One. 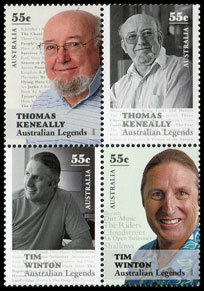 Thomas Keneally (1935-) is best known for writing Schindler's List, the Booker Prize winning novel of 1982, which was later adapted into a Stephen Spielberg film. Tim Winton's (1960-) books mostly feature coastal Western Australia, and has won the Miles Franklin Award a record four times. A young writers award is named in his honour. 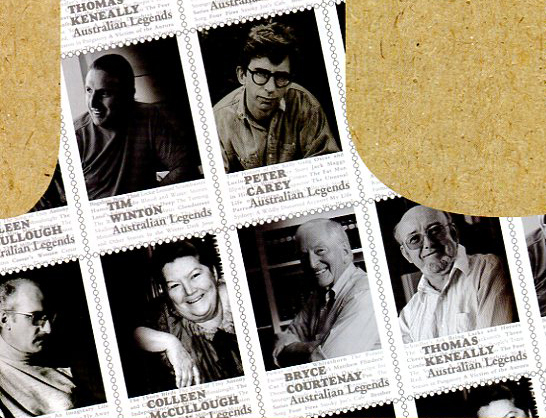 Each novelist is featured on two stamps - a recent colour photograph and an earlier black and white photograph. 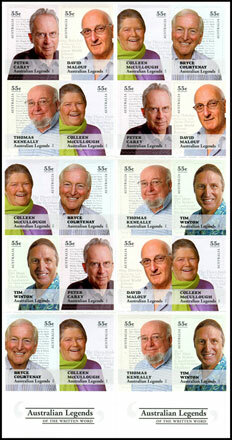 A list of each novelist's work features in the stamp background. The sheet stamps were issued in blocks of four. 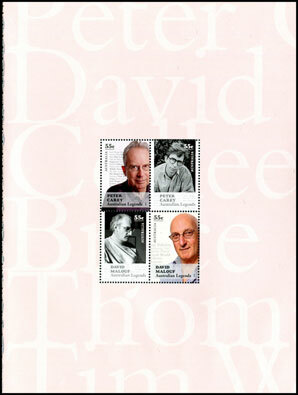 The large prestige booklet contains six panes. The panes contain no new blocks or new stamps (the stamps have the same perforations and paper as the sheet stamps, though there are some very minor shade differences, which are inherent in the lithographic process). The first three prestige booklet panes each contain one of the blocks of four, with the names of the novelists in the background. The other three prestige booklet panes are the most interesting. They are very large (428 mm x 207 mm), and are folded twice to fit into the booklet. Each pane contains colour separations of the twelve stamps, along with two horizontal pairs of stamps. 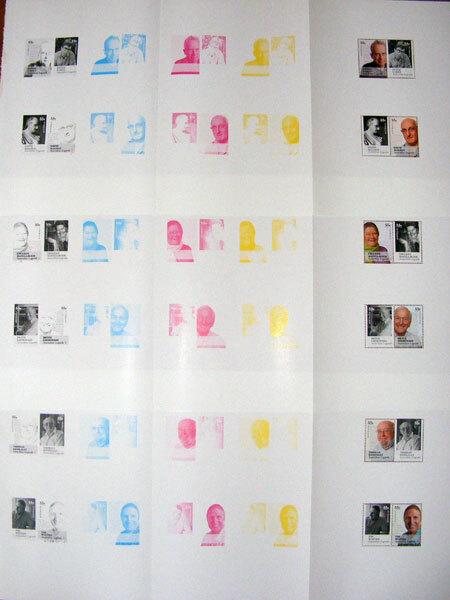 Some have suggested that these colour separations should be included in the face value of the booklet. I believe this is incorrect. These are not stamps, and are not valid for postage (even if used as an entire sheet) - there are effectively cinderellas, and have been produced solely for collectors. 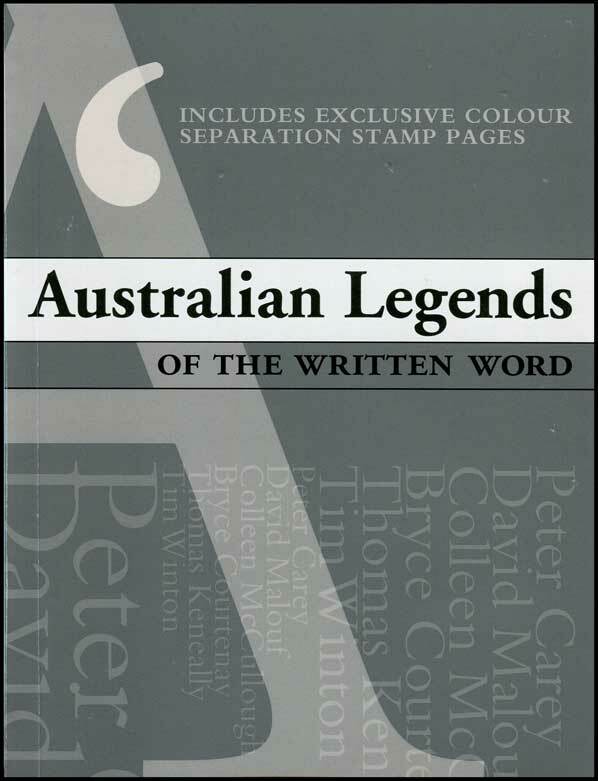 The booklet contains $13.20 worth of stamps. The large prestige booklet is the same size as the 'Behind the Stamp' booklets. The prestige booklet also includes a page giving information on the production of the colour separation panes. The six stamps featuring colour photographs of the Legends were also issued in self-adhesive booklets of 20 stamps. 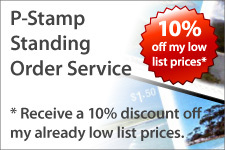 Each stamp has an 'L' shaped phosphor tagging, which differs between the stamps. 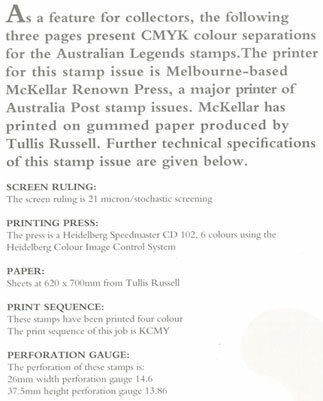 The phosphor tagging on the Carey and Keneally stamps is the same, as is the tagging on the Winton and Malouf stamps. The tagging on the McCullough and Courtenay stamps is shown above. Interestingly the Courtenay tagging finishes 5 mm from the bottom of the stamp, whereas the tagging on the others continues to the bottom of the stamp. 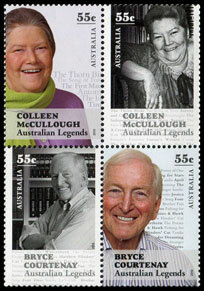 The self-adhesive booklet contains three of each Legend, except for the McCollough stamp which appears five times. 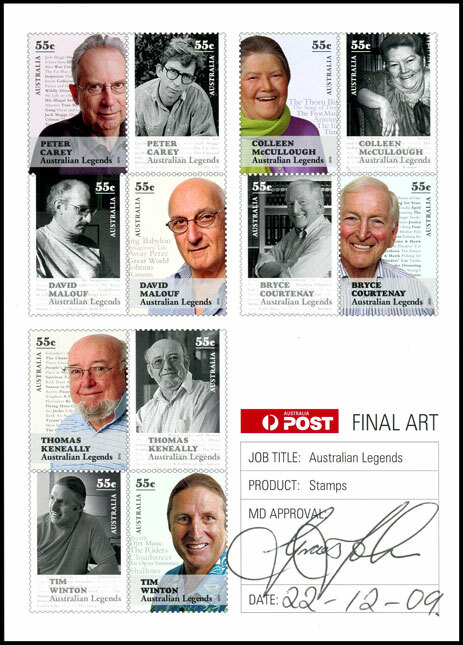 Readers of the latest edition of Priority Magazine would've seen an interesting configuration of the Legends stamps. This configuration was put together by the magazine's designer using images of the stamps. This was also done in a previous Priority magazine with the 2009 Legends issue. Astute collectors though will notice that the 'stamps' are without face value, and there's a very good reason for this. 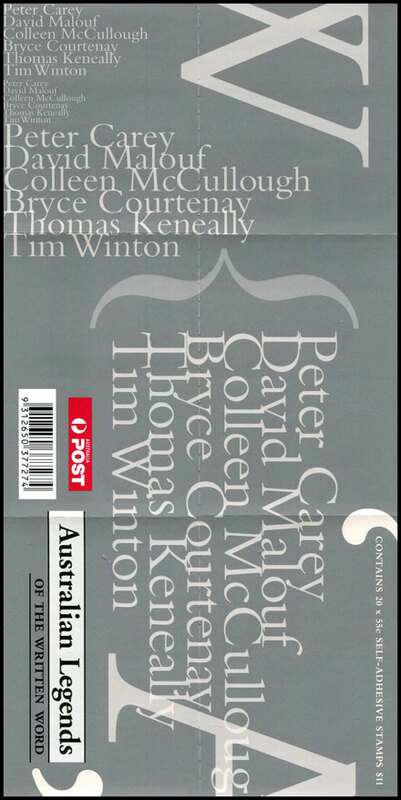 This edition was put together before the ACCC had made its decision on Australia Post's rate increase to 60c, and hence the values were not included. 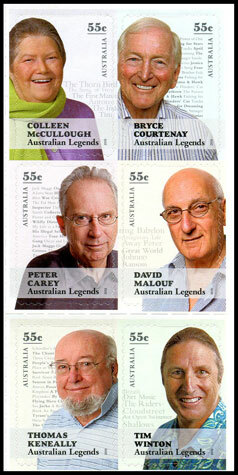 However, Australia Post has advised me that 60c versions of the Legends stamps were printed, and subsequently destroyed. 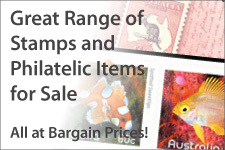 While it is unlikely that any 60c stamps escaped, keep your eyes open, as you never know your luck! 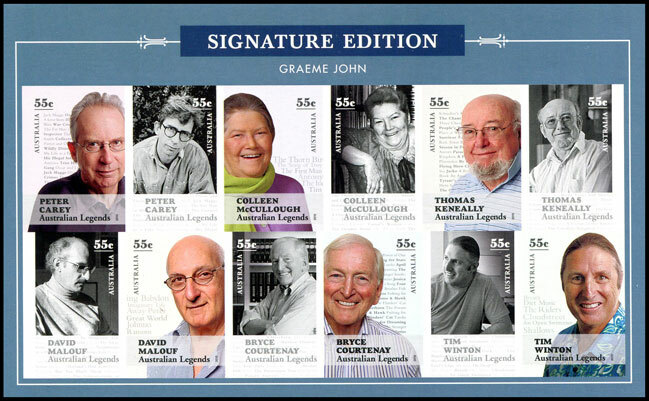 To commemorate the retirement of Managing Director, Mr Graeme John, Australia Post has produced a special folder containing a facsimile of the final art proof and an imperforate miniature sheet. 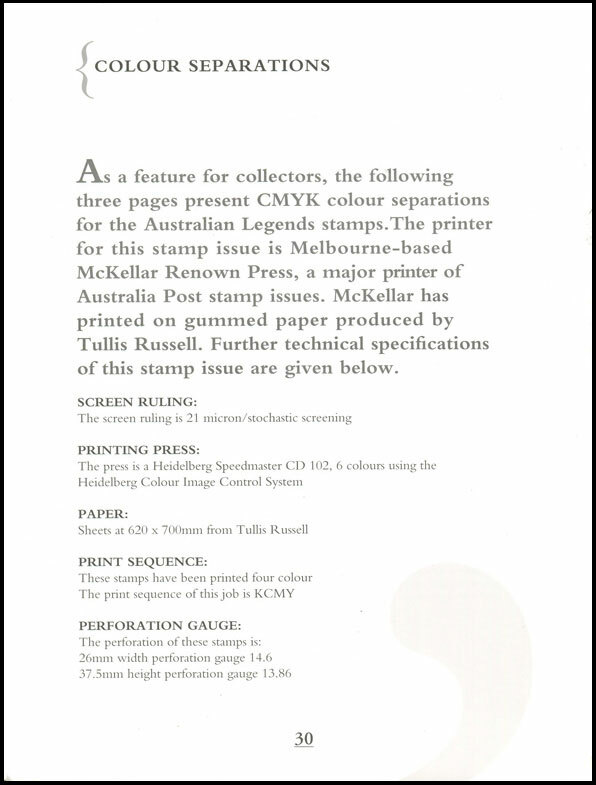 The art proof is printed on thicker than normal paper, and as is the case with the colour separations, is not valid for postage, and can not be included in the face value of the contents. Having said that, collectors will want to include this proof in their collection as it shows another part of the stamp production process. The imperforate sheet appears to be printed on the same paper as the regular sheet stamp. The sheet is only valid for postage if used in one piece. This sheet produces 12 new imperforate stamps, as well as a miniature sheet for this issue. As with many special packs, there is no official date of issue. The pack was listed in Stamp Bulletin No. 303 (available from 9 February 2010), and could be ordered from Mail Order from that date. The pack could be ordered online from 11 March 2010 (Australia Post quotes a date of 1 March 2010 on their site, but further investigation does not support this). The pack was available at Canberra Stamp Show on 13 March, and will no doubt be distributed to philatelic post offices in due course. 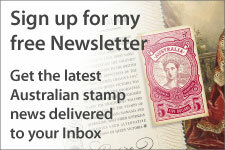 It has been mentioned on Stampboards that Sydney GPO had the pack on sale on 5 March 2010. This site will now quote 5 March as the earliest release date, unless otherwise advised. Six maximum cards, each with two stamps on the front, were issued for this set.